Mood board: Mrs Prada unfurled a candy box of perfect, tissue-lined pastel colours with touches of sour lime and days-old-lemon for autumn. The prim palette was cut into proper, but weirdly twisted, almost robotic 1960s silhouettes like skin tight, scuba-esque pant suiting, and were worn with bouffants that had been yanked left of centre. Best in show: Striped tweed jackets were shot up with pastel mink strips, black contrasting collars and oversized corsages crafted from plastic, mirror and sparkling crystals. Finishing touches: Thankfully the trousers were cropped short so that a flash of pastel coloured surfer booties with contrasting plastic soles were visible zipping by below. 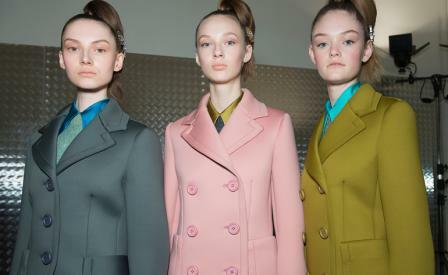 Handbags were stuffed with contrast coloured, built-in beauty bags, while macaroon-hued gloves were as tight as a wetsuit.